The 3,5 room-apartment is located on the 2nd floor and welcomes you with living area of 86m2. The apartment consists of two bedrooms, 1 x double bed, 2 x single beds, a modern bathroom (bath/shower/toilet), a spacious living-kitchen with dishwasher and coffee machine and a very bright living room. The large balcony offers a fantastic view over Eiger, Mönch and Jungfrau. Radio/satellite-TV and free internet (Wi-Fi) is at your disposal. Enjoy the splendid view of the surrounding mountain world. The next bus stop is located nearby and the town centre and railway station can be reached within 5 minutes walking distance. We're a little family, living in the outskirts of Basel - a two hours drive from Grindelwald. Besides skiing in winter, preferably on the Kleine Scheidegg or on the First side of the valley, we're also enjoying the breathtaking hiking trails all around Grindelwald. Wihtout any intention of buying a propoerty in the mountains, we rented this beautiful apartment for week of vacation in winter 2013 - it was love at first sight. After being informed by the property manager, that this apartment will be for sale soon, we did not hesitate for long and realized our dream of having a second home in the mountains for us, our family and our guests. The apartment is located close to the town center and the Ski-Bus stop (around 100m walking distance). Buses leave in both directions, either towards Firstbahn or Männlichen. Additionaly, you can take the train to Kleine Scheidegg at the nearby train station (500m walking distance). The town centre is only a few minutes' walk away, where you can go shopping or just relax. 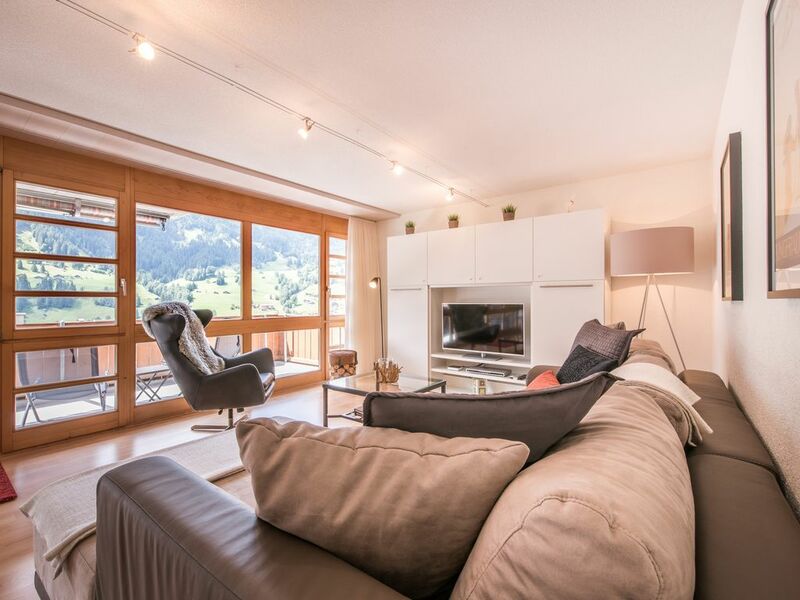 The beautiful and spacious balcony terrace has a view over the entire ski region and the legendary nothern face of the Eiger and is therfore another highlight of our apartment. A prepaid mobile phone is available for national calls. It comes charged with about €10, free of charge. Save on expensive roaming fees! The credit can be topped up for 10 Swiss Francs at the COOP. Over 100 channels in German, French, Italian and English. The reception has a choice of videos. Two (2) sleds are available at no charge. We can provide extra supplies on your arrival day if you so desire. Can not imagine a more beautiful place in the world. A perfect apartment in a perfect town. I would move and retire to this spot in a moment. The apartment was clean with an amazing view and only a moments walk to the center of town. You can pull up, park your car and walk, or use the bus and trains to get everywhere. The apartment has all the amenities you could need and is a great value for the money. It was a great experience, the location of the house was good, the view from the balcony was very beautiful, the landlord has been patiently solving our problems, and we will introduce to more friends. Amazing stay in this property. We woke up each day and enjoyed a coffee, book and the views of the Eiger. Convenient, comfortable location. We cannot wait to come back in the winter months with our children! This is a beautiful, spacious apartment with high quality fittings and a very well equipped kitchen, including a Nespresso machine, a teapot, microwave and dishwasher. A sieve would have been a useful addition. Dishwasher tablets and washing up liquid were provided, also oil, salt & pepper, stock cubes and some spices in a drawer. There is a full length window with a door leading out to the balcony which is furnished to eat out or relax on (or dry the clothes) if you can tear your eyes away from the view which includes the north face of the Eiger. We enjoyed watching the train go up to Jungfraujoch and listening to the river and distant cow bells. The washing machine in the basement was easy to operate for 2CHF. The property manager, 'D' was most helpful and informative and gave us great advice about Grindelwald. There were very few downsides to this accommodation but I would say we found the foam mattress on the double bed very hot to lie on as the mattress cover was rubberised. We would have been glad of a cotton or a wicking layer under the sheet. The apartment is up 3 flights of stairs with no elevator and the 6 minute walk to the train station and the Co-op supermarket is up a steep hill. We didn't find that an issue, but it might be for anyone with mobility, heart or breathing problems. At the very end of our stay, the adjoining apartment was occupied by people who smoked on their balcony, making it less pleasant to sit out on ours, but that was just unfortunate for us and no reflection on this excellent holiday property. We loved it and hope we can remember the view for a long time. Great property, well managed, amazing view from the deck and main room. only issue was 3 flights of stairs! Highly recommend this property. Basis für die Miete ist der Preis in CHF, gegenwärtig umgerechnet mit 1,10 pro EUR (Datum 21.09.2017) Wir akzeptieren Bankzahlung in CHF, EUR (SEPA), GBP oder Zahlung mit Kreditkarte. Bei Kreditkartenzahlung fällt eine Gebühr an (2%-2,8%). Die Kaution (CHF350.-/EUR300.--/GBP 230.--) wird innerhalb von 14 Tagen nach Abreise zurückerstattet, sofern die Wohnung in gutem Zustand verlassen wird.